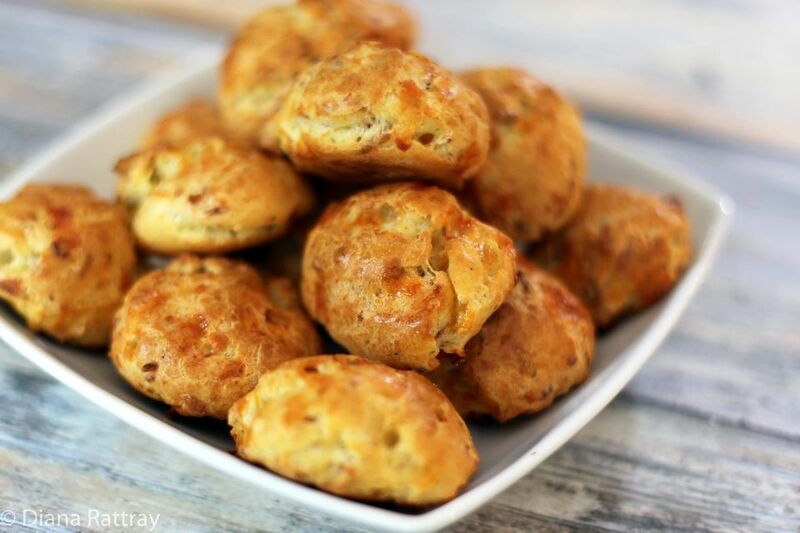 These cheddar and bacon puffs are airy little cheese puffs with loads of flavor. Bake them for a party or family snack. They will be appreciated! The cheese puffs are not difficult to make following the steps below. Have all ingredients and utensils ready and the preparation should be a snap. You'll need a stand mixer or hand-held electric mixer for this recipe. Another great thing about these is that they freeze well. Just reheat them in a 350 F oven. Line two baking sheets with parchment paper or silicone baking mats. Set aside. In a medium saucepan, combine the water, milk or light cream, salt, and butter. Put over high heat and cook, stirring, until butter is melted. Bring to a boil. With a wooden spoon, stir in the flour all at once. Continue stirring until the dough leaves the sides of the pan and forms a ball. Transfer the hot dough to a large mixing bowl or the bowl of a stand mixer with paddle attachment. Let the dough rest for 2 minutes. Beat the hot dough on low speed for 1 minute. Quickly beat in the first egg, beating until thoroughly blended into the dough. Continue beating in the remaining eggs, one at a time, beating well after each addition. Beat in the shredded cheese, bacon, cayenne, and freshly ground black pepper. Continue beating until the dough is smooth and well blended. Using a tablespoon measure or small cookie scoop, drop the dough onto the parchment lined baking sheets. With moistened fingers, smooth any peaks on top of the mounds of dough. If peaks are left, they tend to over-brown or burn. Bake the puffs for about 20 to 22 minutes, until nicely puffed and golden brown. Serve warm or refrigerate or freeze them in storage containers or plastic food storage bags. Reheat in the oven at 350 F until hot. Makes about 3 dozen cheese puffs, depending on size.